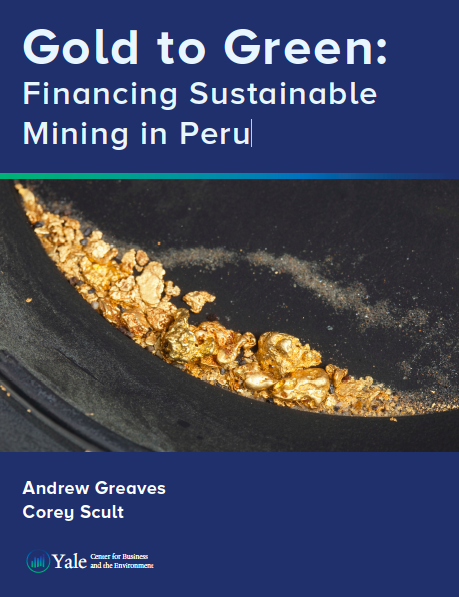 A model to address environmental degradation from gold mining in Peru through finance and technology. Peru is one of the largest gold producers in the world. Artisanal miners clear-cut the rainforest there to reach alluvial gold. To process the ore, they jump waist-deep into barrels where they use their legs to mix gold slurry with toxic mercury, resulting in prolonged skin contact with the dangerous substance. The government has attempted to enforce the legal prohibition on mining in Madre de Dios, but environmental degradation continues, driven by miners’ limited alternative economic opportunities. A potential way to address this problem would be to formalize this economy and foster the use of improved technology. While environmental impacts would not disappear, formally connecting small-scale miners to global markets could incentivize more responsible practices and allow improved government monitoring and enforcement. Improved technology could allow the mining to continue with fewer environmental and health impacts. There is potential for a financial vehicle funded by private investors to provide bridge financing and enable technology adoption that could help move mining in Madre de Dios toward less destructive practices. However, there are many challenges to this model. Perhaps the largest single hurdle is that successful implementation of this plan demands major changes in behavior by the small-scale miners.